SFEMS is delighted to welcome the Choir of New College Oxford in a special, joint presentation with San Francisco’s Grace Cathedral. The choir, under the direction of Robert Quinney, will perform a program of Renaissance and baroque works by Giovanni Pierluigi de Palestrina, Tomás Luis de Victoria, Josquin des Prez, John Taverner, Thomas Tallis and more. The program also will include solo organ works by J.S. Bach and William Byrd, performed by Oxford scholars Timothy Wakerell and Charles Maxtone-Smith. The historical performance movement is based on the notion that using the instruments and practices of other times can clarify our understanding and improve our performance and appreciation of music from those eras. The use of authentic, historical instruments is sometimes a special gift, as was the use of a real, 1841 fortepiano in Valley of the Moon’s recent concert of music by Brahms. In this case it is the ensemble itself which is the historical instrument, in continuous use for over six centuries. Founded in 1379, New College Choir remains one of the world’s most acclaimed choral ensembles featuring boy trebles and men. 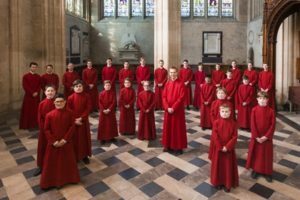 The choir comprises sixteen boy choristers and fourteen adult clerks; the latter a mixture of professional singers and undergraduate members of the college. The choir regularly performs in prestigious venues around the globe including St. Peter’s Basilica and the Sistine Chapel in Rome; St. Mark’s Cathedral in Venice; Cadogan Hall, Royal Albert Hall and St. John’s Smith Square in London; the Concertgebouw in Amsterdam; the National Cathedral in Washington DC; Suntory Hall in Tokyo; and the Sydney Opera House in Australia. New College Choir last performed in the Bay Area—at Grace Cathedral and Stanford—in 2013. Quinney is Organist of New College, Oxford. In addition to the daily direction of New College’s acclaimed choir, he is associate professor in the Faculty of Music, University of Oxford. He also maintains a parallel career as a solo organist, touring to the United States, Australia and Russia, with several televised services, including the marriage of the Duke and Duchess of Cambridge. This special concert—one performance only—will take place on Monday, April 8, 8:00 p.m., at Grace Cathedral, 1100 California St. in San Francisco. Individual tickets, $12 to $45, are available for purchase online at sfems.org or by phone at 510-528-1725 or at the door 45 minutes before the performance.